I saw in the requirements three process scanners. It was unclear to me whether I needed one of the three or all three of them. Oh well here's what I got. O4 - HKLM\..\Run: [NBKeyScan] "C:\Program Files\Nero\Nero BackItUp 4\NBKeyScan.exe"
O4 - HKCU\..\Run: [BitTorrent] "C:\Program Files\BitTorrent\BitTorrent.exe"
Lets begin cleaning your machine up. Please reply back telling us so. If you don't reply within 1-2 days the topic will need to be closed. Sorry for the delay, busy weekend. FF - prefs.js: browser.startup.homepage - hxxp://xfinity.comcast.net/? Auto Update = c:\program files\SmartToolbar\AutoUpdate.exe????@???????t??????????????????????????|????????????????????? ??????? ???????;?=??y7?????[??????????????? "ImagePath"="\"c:\program files\Norton Security Suite\Engine\5.1.0.29\ccSvcHst.exe\" /s \"N360\" /m \"c:\program files\Norton Security Suite\Engine\5.1.0.29\diMaster.dll\" /prefetch:1"
It looks like combofix cleaned up alot of what was slowing you down. Lets do a couple other scans to make sure nothing is left. Please download Malwarebytes Anti-Malware and save it to your desktop. Important!! When you save the mbam-setup file, rename it to something random (such as 123abc.exe) before beginning the download. Malwarebytes may "make changes to your registry" as part of its disinfection routine. If using other security programs that detect registry changes (ie Spybot's Teatimer), they may interfere or alert you. Temporarily disable such programs or permit them to allow the changes. Make sure you are connected to the Internet and double-click on the renamed file to install the application. For instructions with screenshots, please refer to this Guide. Malwarebytes will automatically start and you will be asked to update the program before performing a scan. If an update is found, the program will automatically update itself. Press the OK button and continue. If you encounter any problems while downloading the definition updates, manually download them from here and just double-click on mbam-rules.exe to install. Under the Scanner tab, make sure the "Perform Quick Scan" option is selected. 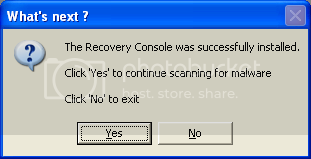 When finished, a message box will say "The scan completed successfully. Click 'Show Results' to display all objects found". Click OK to close the message box, then click the Show Results button to see a list of any malware that was found. Make sure that everything is checked and then click Remove Selected. The log is automatically saved and can be viewed by clicking the Logs tab. Copy and paste the contents of that report in your next reply. Be sure to post the complete log to include the top portion which shows the database version and your operating system. Note: If Malwarebytes encounters a file that is difficult to remove, you will be asked to reboot your computer so it can proceed with the disinfection process. If asked to restart the computer, please do so immediately. Failure to reboot normally will prevent Malwarebytes from removing all the malware. Hold down Control and click on this link to open ESET OnlineScan in a new window. Click on esetsmartinstaller_enu.exe to download the ESET Smart Installer. Save it to your desktop. Under scan settings, check "Scan Archives" and "Remove found threats"
ESET will then download updates for itself, install itself, and begin scanning your computer. Please be patient as this can take some time. Click Export, and save the file to your desktop using a unique name, such as ESETScan. Include the contents of this report in your next reply. it is hard to tell if my computer is much faster as Malwarebytes' Anti-Malware seems to be wanting to do something at start up. I just got an error message from Malwarebytes Anti-Malware (something about a task it was unable to do) this last start-up. HKEY_CURRENT_USER\SOFTWARE\Microsoft\fias4051 (Malware.Trace) -> No action taken. c:\documents and settings\greg david-craft\my documents\downloads\videocodecplugin.exe (Spyware.GamePlayLabs) -> No action taken. After that I restarted the computer (it took a while) then I restarted again (it took a while again) and I got a message from Norton that Malwarebytes Anti-Malwarewas eating a bunch of memory. Yes, it is deleting those files. Please run it again and post the log. Along with the Eset log.